Have you ever wanted to calculate the square footage of your roof without having to get out the ladder? Now you can with just a few taps on your screen! 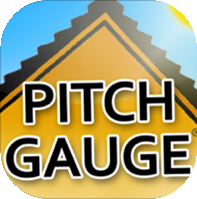 Whether you’re a roofer, carpenter, engineer, contractor, insurance adjuster, firefighter, or a DIY warrior, “Pitch Gauge” is an app that’s ready to help! It allows you to find the pitch of a roof from the safety of the ground, using the camera feature on your iPhone, iPad, Android, Windows, or Blackberry device. You can also input a few numbers to determine how many “squares” your roof is. Pitch Gauge is FREE too! Check it out in your app store or at PitchGauge.com.